The 2018 Boston Whaler 170 Montauk is a new take on a small but classic center console. 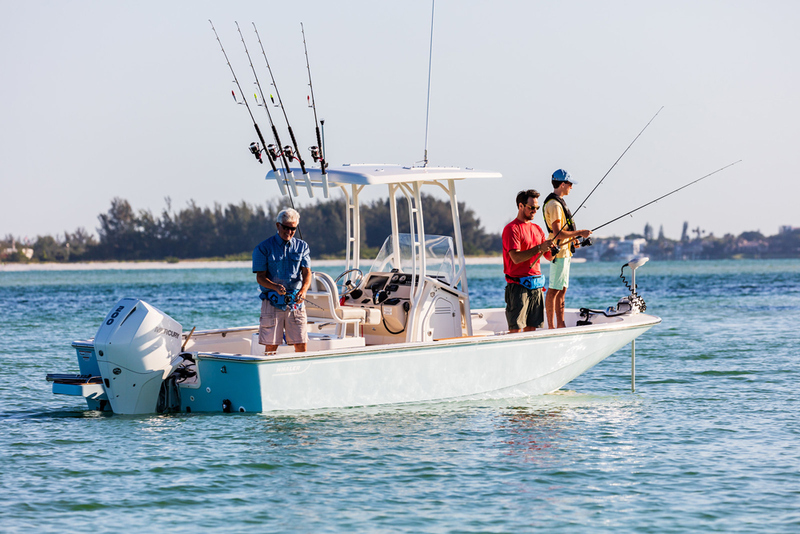 The 2018 Boston Whaler 170 Montauk gives a new spin to classic center console—with innovative refinements and advancements, this model continues the company's "unsinkable" legacy. All the hardware onboard is 361-L grade stainless-steel, and with the stock 90 horsepower Mercury FourStroke outboard on the transom, our reviewers topped out at the 40 MPH mark—while still getting almost five miles to the gallon. And cruising in the mid-20s fuel economy is a rather spectacular 6.5 MPG. See listings for the 170 Montauk, or read our reviews on similar models, like the 190 Montauk or the 210 Montauk. 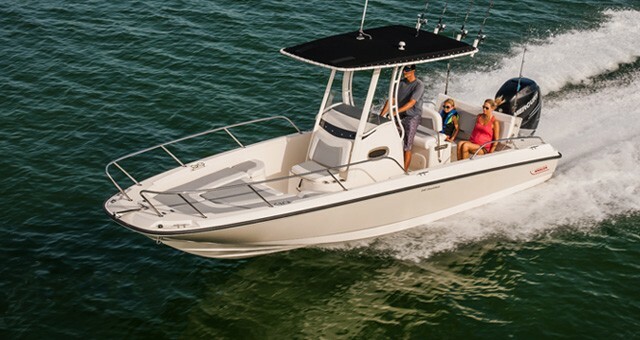 When we set out to identify the best center console boats, the smallest to make our list was the Boston Whaler 190 Montauk—but if we’d down-sized the choices, the Boston Whaler 170 Montauk may well have been on that list, too. Ask around a marina, and it won’t take long to find someone who grew up with a 170 Montauk in the family. The original form of this model has been around for ages, and was one of Whaler's first offerings. 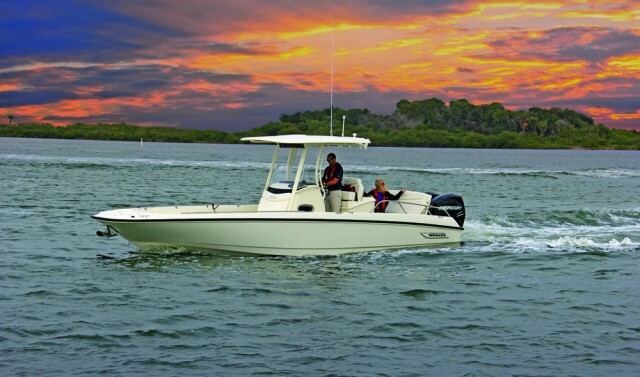 In fact, introduced in the early 70s (first called the Cohasset) the 17-foot Whaler became one of the companies’ most popular models and remained so through the 80s. Today’s 170 Montauk, however, is far more refined and advanced. Spending an afternoon on one with us will show you why. 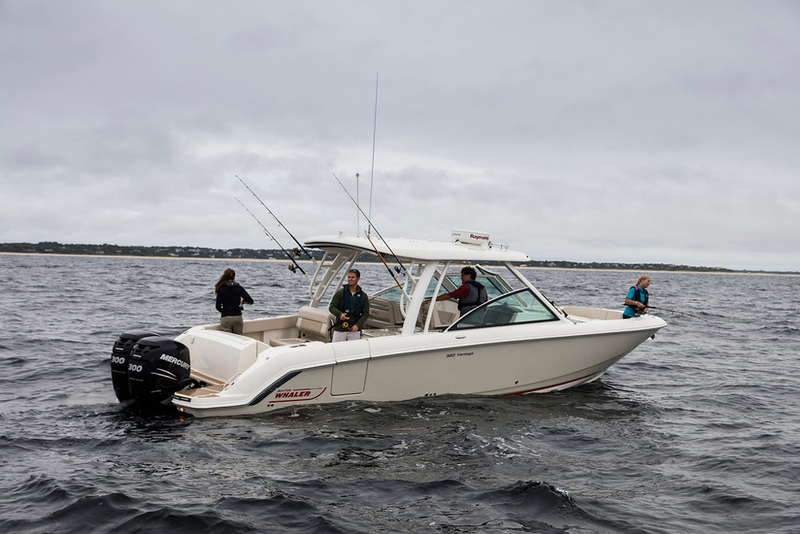 Despite all the newness of the look and design, the 170 Montauk’s construction remains true to the Boston Whaler “unsinkable” heritage. After the inner and outer parts of the boat are molded, the liquid polyurethane foam gets shot in-between them and as it cures, bonds to both. As you saw, once completed the Montauk can be filled with water, gear, passengers, and whatever you’d like, but will remain floating regardless. And in the case of boats this small, that’s particularly important because they commonly depend on a bilge pump to stay afloat. In order for a boat to be self-bailing the deck must always remain above the waterline, with a slight pitch aft so water can run down the deck and out through the scuppers. But this can be difficult to design into an 18- or 19-foot boat, much less a 17-footer. As a result, the vast majority of boats this size can’t self-bail—and the few that lay claim to this ability usually don’t do it very well, especially if any gear, fuel, or passenger weight is aboard. So having that Whaler-constructed hull underfoot, while reassuring on any size boat, is particularly comforting on the 170 Montauk. Note the sump aft; the 170 Montauk depends on a bilge pump to keep the deck dry – but not to stay afloat. The boat’s other components are built with the same sort of ruggedness, which is a common feature found on Whalers throughout their line-up. All hardware is 361-L grade stainless-steel, and it’s all up-sized from what you expect to find on a 17-footer. Hatches are fully finished on both sides and large ones raise on gas-assist struts. 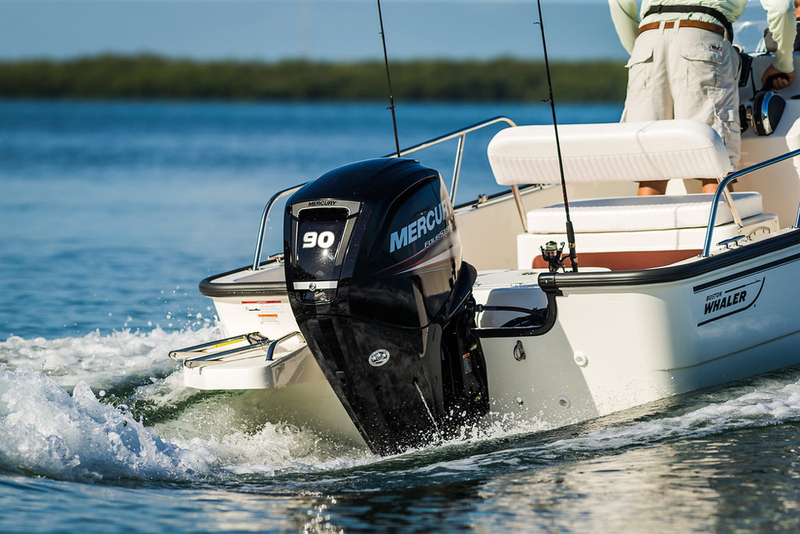 Components like the grab rails and helm seat-back don’t flex easily as they would on some other boats. Even items like the nav light housing and the swing-down telescopic boarding ladder are of a thicker, heavier grade that you’d expect to find on boats this size. Another way the 170 Montauk is light-years advanced as compared to the Montauks of yore: with the stock 90 horsepower Mercury FourStroke outboard on the transom, there’s some seriously peppy performance in store. As you saw in the video, we topped the 40 MPH mark – while still getting almost five miles to the gallon. And cruising in the mid-20s fuel economy is a rather spectacular 6.5 MPG. 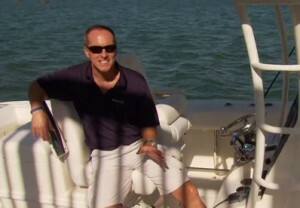 On top of that, however, we hope you were able to tell just how much fun we had running this boat. Carving out hairpin turns, wave-hopping, and generally just blasting about across the bay, it was practically impossible to stop smiling. And isn’t that what owning a boat is all about in the first place? Running the 170 Montauk is good clean fun—especially with the Mercury 90 Fourstroke on the transom. Added bonus: the 90 FourStroke is quiet and clean. Those of us who grew up on small center consoles of decades past remember smoky, vibrating, eardrum-shattering outboards which we were barely able to put up with, especially on a boat of this size where you’re usually standing within a few feet of the powerplant. Those clunky old two-strokes are ancient history, and when we dropped in the electric trolling motor to try some fishing we accidentally left the outboard idling simply because it was so quiet, we forgot it was running in the first place. Speaking of our experiences when we tried fishing from the 170 Montauk: thanks to an unusually high level of available customization on a boat this small, we found that you can rig up the 170 to fit whatever type of fishing you do. The bow-mounted trolling motor is one example. But you can also add goodies like a bow-mounted pedestal fishing seat, a forward 72-quart cooler seat, four console-mounted vertical rodholders, tackle drawers, and an aft livewell. The 170 Montauk can serve as quite an effective fishing platform, too. On the flip side, if you want the boat to be prepared for watersports and family fun, you can add options like a tow arch, Bimini top, and aft port and starboard jump seats. There’s also an option for a full-beam aft bench seat, though this negates the ability to add the livewell. 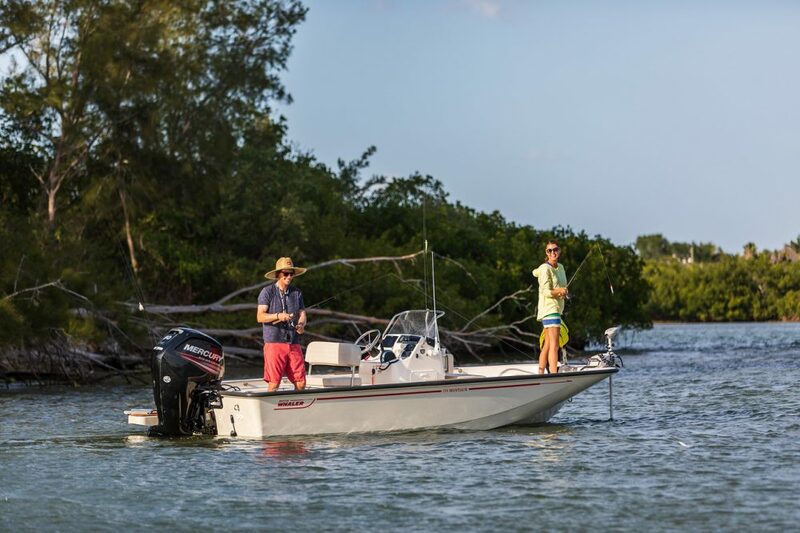 Whether it’s fishing or family time that’s in your future aboard the Boston Whaler 170 Montauk, we can say one thing for sure: there’s also bound to be a lot of fun in store. And thanks to the boats’ stout build and unsinkable nature, that fun’s going to go one for years and years. 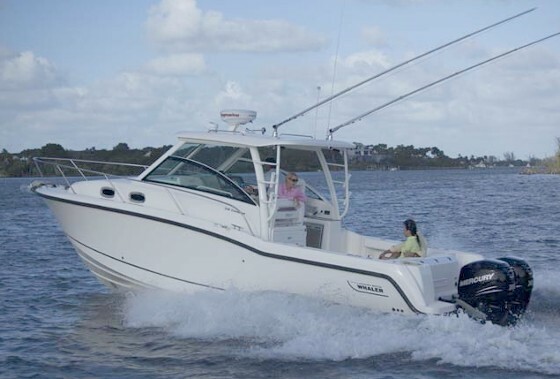 Other Choices: Another high-end 17-footer is the Edgewater 170 CC. Interested shoppers may also want to check out the Robalo R160, which was named one of our Top New Fishing Boats Under $20,000. 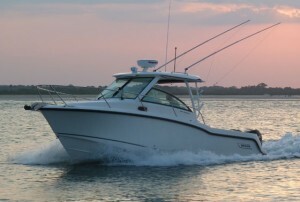 See Boston Whaler 170 Montauk listings.